The Breitling Watch Source Forums • View topic - Untouched or restored on this vintage Datora? Untouched or restored on this vintage Datora? Post subject: Untouched or restored on this vintage Datora? I desperately need your help here in identifying this vintage Datora? Please see the pictures below. Does it look original and unrestored? Post subject: Re: Untouched or restored on this vintage Datora? Thanks for the response, Dracha! Could you be more specific on what makes you reach that conclusion? Or it's just plain obvious? I haven't researched these properly and they are very often faked - but this actually looks good to me? logo is a bit fat, but I lack confirmed good examples of this reference for comparison; overall I see no refinishing indications on the - sadly bad - pictures, the minute tracks isn't as clearly defined as I'd expect, but that may be the picture gain. Renè, share your thoughts ? 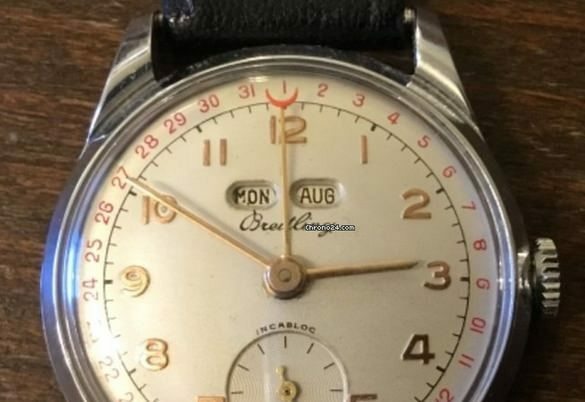 markings and serial check out correctly, case is 1951; watch seems fairly priced. Fred - I think the logo is off. So I’m with Rene on a redial. Hey Dave, thanks for your input! Looks like the logo is at least suspicious. Could you be more specific as why you think the logo is off? Any comparing pictures would be greatly appreciated! 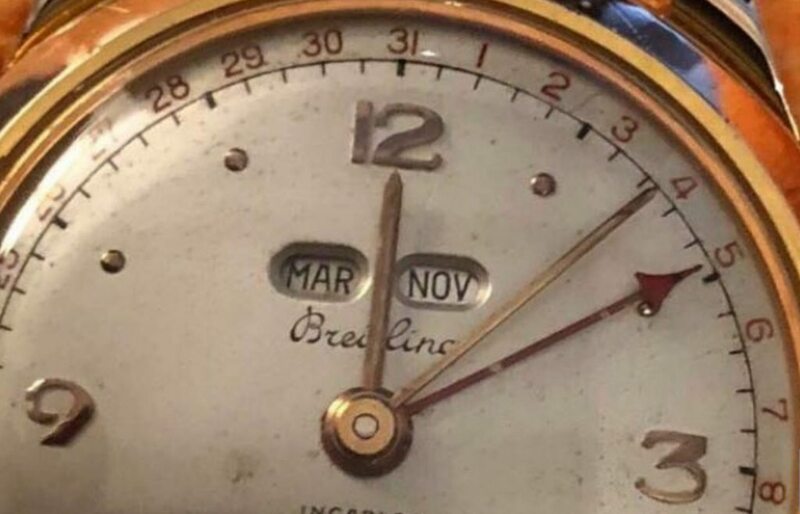 As Fred says these are not well documented and everything else about the watch looks right but the logo is clearly off to me. I will post an image of one that looks correct later when I have time (not mine but one recently shared on some Facebook groups). What you also have to take into account with these type of Datora is the fact a LOT of other brands basically made a very similar watch. So even if the case and movement are correct it is very easy for someone to reprint on a generic dial. We see this all the time with many different watches. Breitling on this particular dial clearly tilted downward from left to right, not square to the dial. But more importantly... if Fred and Rene question it, it’s probably incorrect!! It would be a shame to spend, over spend, on it just to find out later they are right and your floating down Crap Creek paddleless. Posting for David.... here is the image he was referencing. Wayne is having pic upload issues, so here's his post for David. These are for me a “buyer beware” watch. Soooooo many fakes out there. I hate when a watch makes me wonder if it’s coorect! These typically always do! Thank you so much Wayne for posting pictures and sharing your thoughts! 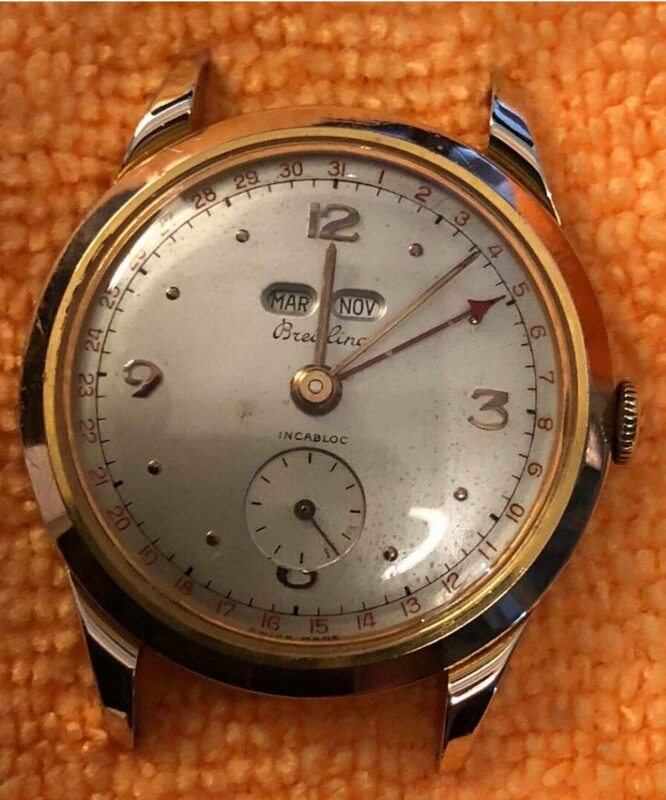 I'm actually in the search of my first vintage watch and I really dig the look of this watch. It's also small in size, which is definitely important for my thin wrist. After the first response from Rene, I was quite disappointed to hear it'a a reprinted dial, but the "not so sure" response from Fred gave me some hope. Then you guys chimed in and now the consensus seems to be "avoid".